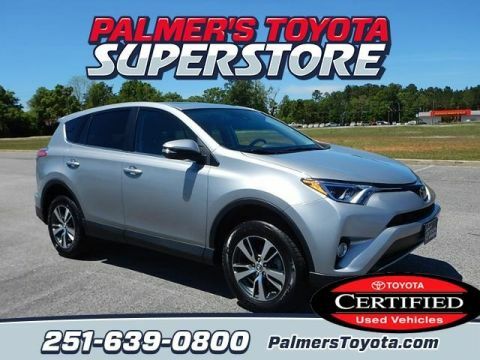 Palmer's Toyota Superstore is your Mobile Toyota dealer! But it’s not just new Toyotas that are hot on our lot – as Mobile’s Toyota superstore, we also pride ourselves on carrying a great selection of used Toyotas, Hondas, and more! We’re your one-stop-shop for the best selection of pre-owned cars, trucks and SUVs for any budget. If you’re looking for used cars in Mobile, stop here first; we’re confident that we’ll be your last stop, too. Clean CARFAX. 43/39 City/Highway MPG Black 2015 Toyota Camry Hybrid LE FWD eCVT 2.5L I4 Hybrid DOHC Proud recipient of Toyota President's Award for 25 Consecutive Years! Call & Come By Today! CARFAX One-Owner. Clean CARFAX. Certified. ***CLEAN CARFAX***, ONE OWNER!, CERTIFIED, BLUE TOOTH. 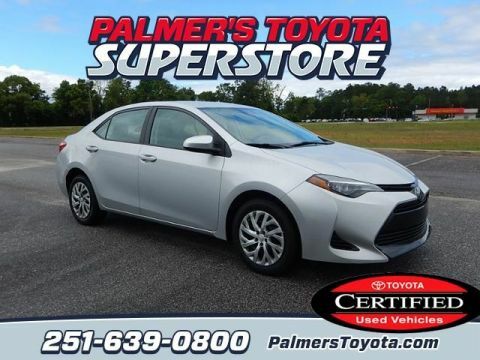 28/36 City/Highway MPG Silver 2018 Toyota Corolla LE FWD CVT 1.8L I4 DOHC Dual VVT-i Toyota Certified Used Vehicles Details: * 160 Point Inspection * Vehicle History * Transferable Warranty * Powertrain Limited Warranty: 84 Month/100,000 Mile (whichever comes first) from original in-service date * Limited Comprehensive Warranty: 12 Month/12,000 Mile (whichever comes first) from certified purchase date. Roadside Assistance for 1 Year * Roadside Assistance * Warranty Deductible: $50 Proud recipient of Toyota President's Award for 25 Consecutive Years! Call & Come By Today! Certified. Gray 2017 Toyota Corolla SE FWD 1.8L I4 DOHC Dual VVT-i Toyota Certified Used Vehicles Details: * Warranty Deductible: $50 * Roadside Assistance * Limited Comprehensive Warranty: 12 Month/12,000 Mile (whichever comes first) from certified purchase date. Roadside Assistance for 1 Year * Vehicle History * Powertrain Limited Warranty: 84 Month/100,000 Mile (whichever comes first) from original in-service date * Transferable Warranty * 160 Point Inspection Awards: * 2017 KBB.com 10 Best Sedans Under $25,000 * 2017 KBB.com 5-Year Cost to Own Awards * 2017 KBB.com 10 Most Awarded Brands * 2017 KBB.com Best Resale Value Awards Proud recipient of Toyota President's Award for 25 Consecutive Years! Call & Come By Today! CARFAX One-Owner. Clean CARFAX. Certified. ***CLEAN CARFAX***, ONE OWNER!, NONSmoker, CERTIFIED, BLUE TOOTH. 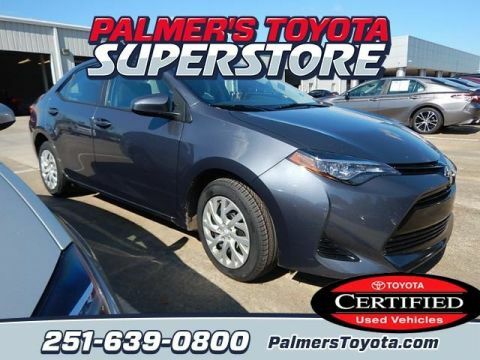 28/36 City/Highway MPG Black 2018 Toyota Corolla LE FWD CVT 1.8L I4 DOHC Dual VVT-i Toyota Certified Used Vehicles Details: * Limited Comprehensive Warranty: 12 Month/12,000 Mile (whichever comes first) from certified purchase date. Roadside Assistance for 1 Year * Powertrain Limited Warranty: 84 Month/100,000 Mile (whichever comes first) from original in-service date * Roadside Assistance * Warranty Deductible: $50 * Vehicle History * 160 Point Inspection * Transferable Warranty Proud recipient of Toyota President's Award for 25 Consecutive Years! Call & Come By Today! CARFAX One-Owner. Clean CARFAX. Certified. ***CLEAN CARFAX***, ONE OWNER!, CERTIFIED, BLUE TOOTH. 28/36 City/Highway MPG 2018 Toyota Corolla LE FWD CVT 1.8L I4 DOHC Dual VVT-i Toyota Certified Used Vehicles Details: * Warranty Deductible: $50 * Transferable Warranty * Limited Comprehensive Warranty: 12 Month/12,000 Mile (whichever comes first) from certified purchase date. Roadside Assistance for 1 Year * Roadside Assistance * Powertrain Limited Warranty: 84 Month/100,000 Mile (whichever comes first) from original in-service date * Vehicle History * 160 Point Inspection Proud recipient of Toyota President's Award for 25 Consecutive Years! Call & Come By Today! CARFAX One-Owner. Clean CARFAX. Certified. 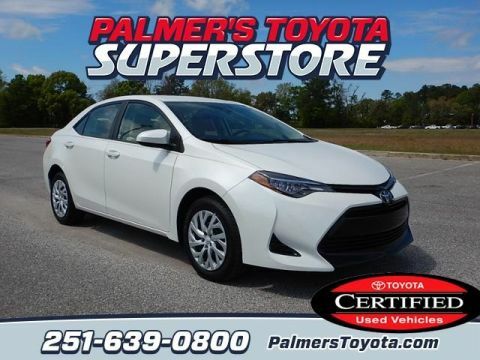 28/36 City/Highway MPG White 2018 Toyota Corolla LE FWD CVT 1.8L I4 DOHC Dual VVT-i Toyota Certified Used Vehicles Details: * Vehicle History * Roadside Assistance * Limited Comprehensive Warranty: 12 Month/12,000 Mile (whichever comes first) from certified purchase date. Roadside Assistance for 1 Year * Powertrain Limited Warranty: 84 Month/100,000 Mile (whichever comes first) from original in-service date * Transferable Warranty * Warranty Deductible: $50 * 160 Point Inspection Proud recipient of Toyota President's Award for 25 Consecutive Years! Call & Come By Today! CARFAX One-Owner. Clean CARFAX. Certified. ***CLEAN CARFAX***, ONE OWNER!, NONSmoker, CERTIFIED, BLUE TOOTH. 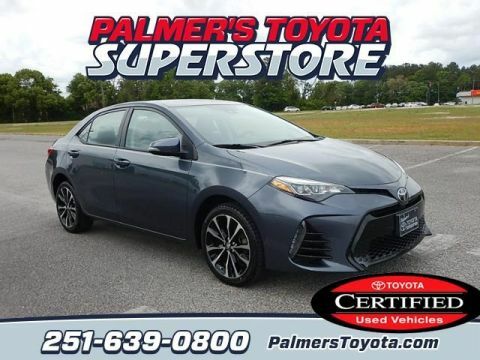 28/36 City/Highway MPG Gray 2018 Toyota Corolla LE FWD CVT 1.8L I4 DOHC Dual VVT-i Toyota Certified Used Vehicles Details: * 160 Point Inspection * Powertrain Limited Warranty: 84 Month/100,000 Mile (whichever comes first) from original in-service date * Limited Comprehensive Warranty: 12 Month/12,000 Mile (whichever comes first) from certified purchase date. Roadside Assistance for 1 Year * Warranty Deductible: $50 * Roadside Assistance * Vehicle History * Transferable Warranty Proud recipient of Toyota President's Award for 25 Consecutive Years! Call & Come By Today! CARFAX One-Owner. Clean CARFAX. Certified. ***CLEAN CARFAX***, ONE OWNER!, NONSmoker, CERTIFIED, BLUE TOOTH. 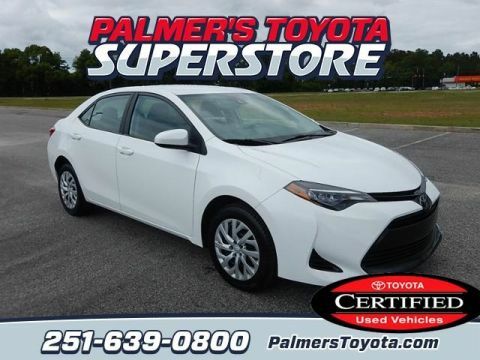 28/36 City/Highway MPG White 2018 Toyota Corolla LE FWD CVT 1.8L I4 DOHC Dual VVT-i Toyota Certified Used Vehicles Details: * Warranty Deductible: $50 * 160 Point Inspection * Powertrain Limited Warranty: 84 Month/100,000 Mile (whichever comes first) from original in-service date * Limited Comprehensive Warranty: 12 Month/12,000 Mile (whichever comes first) from certified purchase date. Roadside Assistance for 1 Year * Transferable Warranty * Roadside Assistance * Vehicle History Proud recipient of Toyota President's Award for 25 Consecutive Years! Call & Come By Today! Gray 2013 Toyota Tacoma PreRunner RWD 4-Speed Automatic with Overdrive 2.7L I4 DOHC 16V Awards: * ALG Best Residual Value * 2013 KBB.com Best Resale Value Awards * 2013 KBB.com Brand Image Awards Proud recipient of Toyota President's Award for 25 Consecutive Years! Call & Come By Today! CARFAX One-Owner. Clean CARFAX. Certified. ***CLEAN CARFAX***, ONE OWNER!, CERTIFIED, BLUE TOOTH. 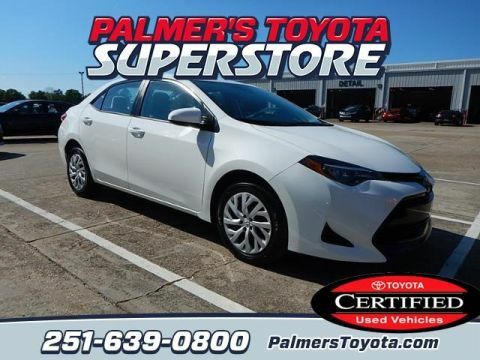 28/36 City/Highway MPG White 2018 Toyota Corolla LE FWD CVT 1.8L I4 DOHC Dual VVT-i Toyota Certified Used Vehicles Details: * 160 Point Inspection * Roadside Assistance * Powertrain Limited Warranty: 84 Month/100,000 Mile (whichever comes first) from original in-service date * Warranty Deductible: $50 * Limited Comprehensive Warranty: 12 Month/12,000 Mile (whichever comes first) from certified purchase date. Roadside Assistance for 1 Year * Transferable Warranty * Vehicle History Proud recipient of Toyota President's Award for 25 Consecutive Years! Call & Come By Today! CARFAX One-Owner. Clean CARFAX. Certified. ***CLEAN CARFAX***, ONE OWNER!, CERTIFIED, BLUE TOOTH. 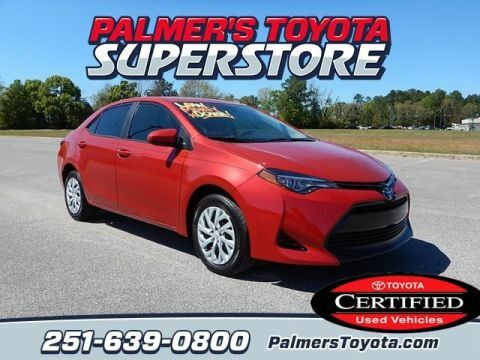 28/36 City/Highway MPG Red 2018 Toyota Corolla LE FWD CVT 1.8L I4 DOHC Dual VVT-i Toyota Certified Used Vehicles Details: * Powertrain Limited Warranty: 84 Month/100,000 Mile (whichever comes first) from original in-service date * Limited Comprehensive Warranty: 12 Month/12,000 Mile (whichever comes first) from certified purchase date. Roadside Assistance for 1 Year * Vehicle History * Warranty Deductible: $50 * 160 Point Inspection * Transferable Warranty * Roadside Assistance Proud recipient of Toyota President's Award for 25 Consecutive Years! Call & Come By Today! CARFAX One-Owner. Clean CARFAX. Certified. ***CLEAN CARFAX***, ONE OWNER!, Local Trade, ALLOY WHEELS, NEW ARRIVAL!! !, CERTIFIED, BLUE TOOTH. 23/30 City/Highway MPG Black 2016 Toyota RAV4 XLE FWD 6-Speed Automatic 2.5L 4-Cylinder DOHC Dual VVT-i Toyota Certified Used Vehicles Details: * 160 Point Inspection * Transferable Warranty * Warranty Deductible: $50 * Powertrain Limited Warranty: 84 Month/100,000 Mile (whichever comes first) from original in-service date * Roadside Assistance * Limited Comprehensive Warranty: 12 Month/12,000 Mile (whichever comes first) from certified purchase date. Roadside Assistance for 1 Year * Vehicle History Awards: * 2016 IIHS Top Safety Pick+ * 2016 KBB.com 10 Best SUVs Under $25,000 Proud recipient of Toyota President's Award for 25 Consecutive Years! Call & Come By Today! CARFAX One-Owner. Clean CARFAX. Certified. ***CLEAN CARFAX***, ONE OWNER!, ALLOY WHEELS, NONSmoker, NEW ARRIVAL!! !, CERTIFIED, BLUE TOOTH. 28/39 City/Highway MPG Black 2018 Toyota Camry SE FWD 8-Speed Automatic 2.5L I4 DOHC 16V Toyota Certified Used Vehicles Details: * Warranty Deductible: $50 * Powertrain Limited Warranty: 84 Month/100,000 Mile (whichever comes first) from original in-service date * Roadside Assistance * Transferable Warranty * Vehicle History * 160 Point Inspection * Limited Comprehensive Warranty: 12 Month/12,000 Mile (whichever comes first) from certified purchase date. Roadside Assistance for 1 Year Proud recipient of Toyota President's Award for 25 Consecutive Years! Call & Come By Today! CARFAX One-Owner. Clean CARFAX. Certified. ***CLEAN CARFAX***, ONE OWNER!, ALLOY WHEELS, NONSmoker, CERTIFIED, BLUE TOOTH. 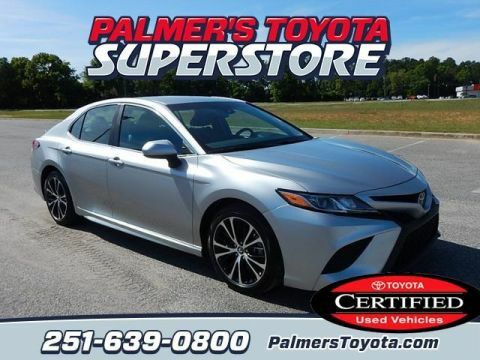 28/39 City/Highway MPG Silver 2018 Toyota Camry SE FWD 8-Speed Automatic 2.5L I4 DOHC 16V Toyota Certified Used Vehicles Details: * Vehicle History * Transferable Warranty * Roadside Assistance * Warranty Deductible: $50 * Limited Comprehensive Warranty: 12 Month/12,000 Mile (whichever comes first) from certified purchase date. Roadside Assistance for 1 Year * 160 Point Inspection * Powertrain Limited Warranty: 84 Month/100,000 Mile (whichever comes first) from original in-service date Proud recipient of Toyota President's Award for 25 Consecutive Years! Call & Come By Today! CARFAX One-Owner. Clean CARFAX. Certified. ***CLEAN CARFAX***, ONE OWNER!, Sunroof / Moonroof, NAVIGATION, CERTIFIED, BLUE TOOTH. Priced below KBB Fair Purchase Price! 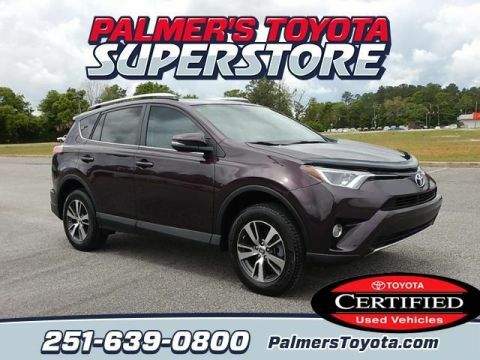 23/30 City/Highway MPG 2018 Toyota RAV4 XLE FWD 6-Speed Automatic 2.5L 4-Cylinder DOHC Dual VVT-i Toyota Certified Used Vehicles Details: * Roadside Assistance * Transferable Warranty * Limited Comprehensive Warranty: 12 Month/12,000 Mile (whichever comes first) from certified purchase date. Roadside Assistance for 1 Year * Warranty Deductible: $50 * 160 Point Inspection * Vehicle History * Powertrain Limited Warranty: 84 Month/100,000 Mile (whichever comes first) from original in-service date Proud recipient of Toyota President's Award for 25 Consecutive Years! Call & Come By Today! CARFAX One-Owner. Clean CARFAX. Certified. ***CLEAN CARFAX***, ONE OWNER!, ALLOY WHEELS, UPGRADED SOUND SYSTEM!, CERTIFIED, BLUE TOOTH. 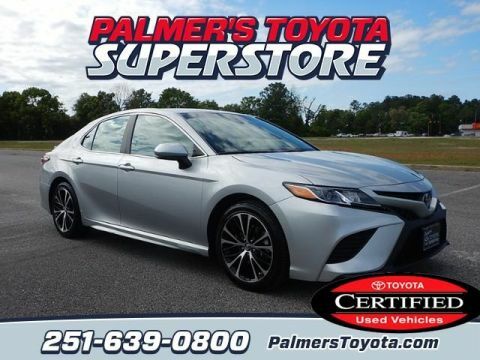 28/39 City/Highway MPG Silver 2018 Toyota Camry SE FWD 8-Speed Automatic 2.5L I4 DOHC 16V Toyota Certified Used Vehicles Details: * Roadside Assistance * 160 Point Inspection * Warranty Deductible: $50 * Limited Comprehensive Warranty: 12 Month/12,000 Mile (whichever comes first) from certified purchase date. Roadside Assistance for 1 Year * Transferable Warranty * Powertrain Limited Warranty: 84 Month/100,000 Mile (whichever comes first) from original in-service date * Vehicle History Proud recipient of Toyota President's Award for 25 Consecutive Years! Call & Come By Today! CARFAX One-Owner. Clean CARFAX. Certified. ***CLEAN CARFAX***, ONE OWNER!, CERTIFIED, BLUE TOOTH. 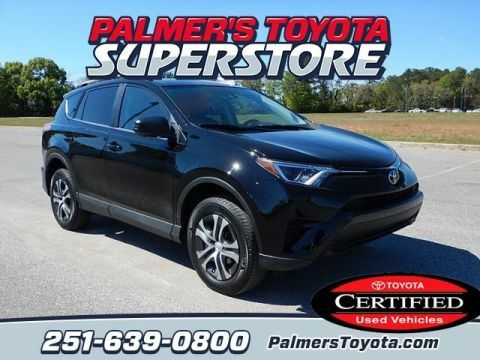 23/30 City/Highway MPG Black 2018 Toyota RAV4 LE FWD 6-Speed Automatic 2.5L 4-Cylinder DOHC Dual VVT-i Toyota Certified Used Vehicles Details: * Transferable Warranty * Powertrain Limited Warranty: 84 Month/100,000 Mile (whichever comes first) from original in-service date * 160 Point Inspection * Warranty Deductible: $50 * Vehicle History * Roadside Assistance * Limited Comprehensive Warranty: 12 Month/12,000 Mile (whichever comes first) from certified purchase date. Roadside Assistance for 1 Year Proud recipient of Toyota President's Award for 25 Consecutive Years! Call & Come By Today! CARFAX One-Owner. Clean CARFAX. Certified. ***CLEAN CARFAX***, ONE OWNER!, ALLOY WHEELS, UPGRADED SOUND SYSTEM!, NONSmoker, CERTIFIED, BLUE TOOTH. 28/39 City/Highway MPG 2018 Toyota Camry SE FWD 8-Speed Automatic 2.5L I4 DOHC 16V Toyota Certified Used Vehicles Details: * Roadside Assistance * Transferable Warranty * Limited Comprehensive Warranty: 12 Month/12,000 Mile (whichever comes first) from certified purchase date. Roadside Assistance for 1 Year * 160 Point Inspection * Vehicle History * Powertrain Limited Warranty: 84 Month/100,000 Mile (whichever comes first) from original in-service date * Warranty Deductible: $50 Proud recipient of Toyota President's Award for 25 Consecutive Years! Call & Come By Today! CARFAX One-Owner. Clean CARFAX. Certified. ***CLEAN CARFAX***, ONE OWNER!, ALLOY WHEELS, CERTIFIED, BLUE TOOTH. 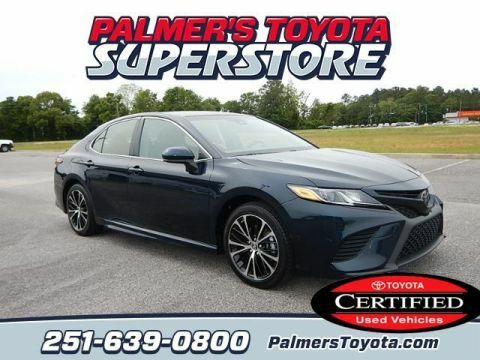 28/39 City/Highway MPG Black 2018 Toyota Camry SE FWD 8-Speed Automatic 2.5L I4 DOHC 16V Toyota Certified Used Vehicles Details: * Warranty Deductible: $50 * Limited Comprehensive Warranty: 12 Month/12,000 Mile (whichever comes first) from certified purchase date. Roadside Assistance for 1 Year * Roadside Assistance * 160 Point Inspection * Transferable Warranty * Vehicle History * Powertrain Limited Warranty: 84 Month/100,000 Mile (whichever comes first) from original in-service date Proud recipient of Toyota President's Award for 25 Consecutive Years! Call & Come By Today! CARFAX One-Owner. Certified. ONE OWNER!, ALLOY WHEELS, CERTIFIED, BLUE TOOTH. 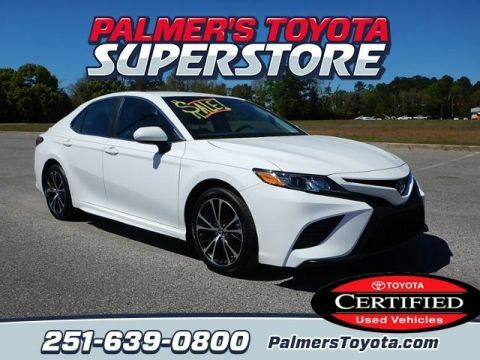 28/39 City/Highway MPG White 2018 Toyota Camry SE FWD 8-Speed Automatic 2.5L I4 DOHC 16V Toyota Certified Used Vehicles Details: * Limited Comprehensive Warranty: 12 Month/12,000 Mile (whichever comes first) from certified purchase date. Roadside Assistance for 1 Year * Roadside Assistance * Powertrain Limited Warranty: 84 Month/100,000 Mile (whichever comes first) from original in-service date * Vehicle History * Warranty Deductible: $50 * Transferable Warranty * 160 Point Inspection Proud recipient of Toyota President's Award for 25 Consecutive Years! Call & Come By Today!